The research, published in Physical Review B as a Rapid Communication, has potential applications in photonics devices that are based on the optical properties of quantum wells. Resonance fluorescence is fluorescence from an atom or molecule in which the light emitted is at the same frequency as the light absorbed. To study this process, theoretical physicists often rely on a very crude ‘two-level system’ approximation, in which all the physical characteristics of the atom are collapsed to having an electron either in a lower or in an excited level. Despite its simplicity, this model can successfully describe light-matter interactions in many quantum systems other than atoms, such as quantum dots and superconducting qubits. The scenario becomes more complex when the experiment is performed on a doped quantum well, a 2D nanostructure made of different semiconductor layers as thin as a few atomic layers, in which electrons are densely packed. Quantum interference occurring in the 2D electron gas trapped between semiconductor layers then modifies the resonance fluorescence spectrum, the new study shows. “Electron excitations in these 2D nanostructures can still be modeled as a collection of two-level systems,” says Nathan Shammah, PhD student in the Quantum Light and Matter Group and co-author of the study. “Yet the assumption that these are non-interacting and independent atom-like systems fails to account for ‘crossed’ electron transitions that occur between different two-level systems, a possibility open in the 2D electron gas,” he adds. 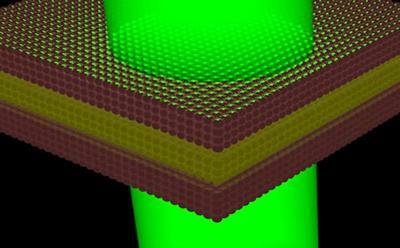 With this enhanced possibility applied to 2D nanostructures, the Southampton researchers described new effects in the emitted light they expect. At first, electrons oscillate coherently between two levels as in a collective dance. As time goes on, electrons can get out of phase with each other because of other scattering processes. When two-level systems are out of phase, these crossed transitions are impeded due to Pauli’s exclusion principle. This leads to a modification in the resonance fluorescence spectrum of the system, and in turn, the difference between the two coherent and incoherent regimes of electron dynamics can be determined. “This new mechanism hints at the intriguing possibility of measuring the coherence time of a 2D electron gas with resonance fluorescence,” adds Dr Simone De Liberato, co-author of the research and leader of the University’s Quantum Theory and Technology Group, which explores areas where quantum mechanics can be exploited to gain a decisive technological edge over classical counterparts. The research was partially supported by the EPSRC and the Royal Society.